Here's Embassy of Silence, another female-fronted metal band from Finland. Isn't that a rather odd thing? Curb my enthusiasm, or at the very least my sarcasm. No, they don't sound like that other band, at least not entirely. Embassy of Silence: attacked by black eyeliner. 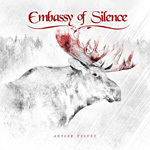 On their second album Antler Velvet, Embassy of Silence leans more towards traditional melodic heavy metal, with nods to both the power and symphonic side. This is nothing clever or novel. But their style is assertive, but not overbearing; you'll know this is a metal album. From the gate Trickster Queen and Unconverted pull out the stops. EoS has wall of sound made of dense guitar riffage and atmospheric keyboards. And there's some killer guitar solos throughout. But none of this overwhelms versatile singer Ines Lukkanen. It merely carries her forward and uplifts her. Not quite the full operatic style, Lukkanen can be clear and strong, subtle and powerful. The Gemini Ascendant, Conundrum, and Touch the Zenith, all fine songs, demonstrate her depth. The combination of her vocals and the aforementioned powerful melodic metal rises to epic proportion with Prodigal Son and Unconverted. Overall, while the musical genre is conventional, Embassy of Silence's presentation is a powerful, and entertaining, one. Recommended, especially for fans of more traditional female-fronted metal. While the musical genre is conventional, Embassy of Silence's presentation on Antler Velvet is a powerful, and entertaining, one. Recommended, especially for fans of more traditional female-fronted metal.